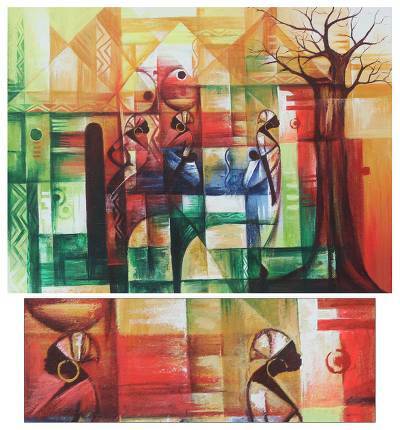 African Cubist Painting, "Peace Village"
Geometric shapes cover an intricate canvas, revealing houses clustered in a rural hamlet. Beneath the spreading branches of a venerable tree, women pause in their chores for a moment of conversation. "I depict different faces to describe how different people without similar backgrounds nonetheless learn to live harmoniously in a peaceful society," says artist Bright Dankyi Mensah. "Love one another!"